He's handsome isn't he. All sharp in his red and purple bottle with the crisp white. He does exactly what he says he will. He holds up during the test of time. He gets along well with all my other friends, like paper and chipboard. He is perfectly sized. Not too tall or short. He never leaves a mess. Yep, I compare all guys I date to my favorite adhesive. Now, if I could just find a guy that was half the things this glue is. I buy it here and can't speak more highly of it. Just got a brand new bottle after 4 months and can't wait for our date night. My snail adhesive is soooooo jealous! I agree... my fave adhesive. Target has this at a good price and with an exclusive rebate (try it free). Look for this on the package. Oh...I had not heard of this...I will have to try it! I just found your blog today and am lobing it. Thanks for sharing. I looked at the clear button tutorial and now I need a trip to the city so I can get me some clear buttons. Yes, sad I know, but I live in a stamping wasteland. I didn't know that you had a special man in your life. 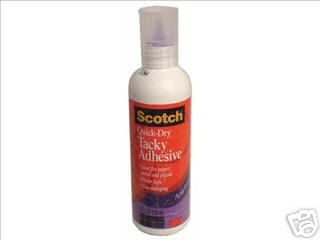 Bought some of this adhesive per your advice and have not had the opportunity to try it but hopefully soon.